Cinemagram, which creates an app that lets people create ultra-short videos (aka GIFs), has rolled out an update which introduces a number of significant new features including support for landscape videos, and a simplified editing process. The introduction of support for landscape videos is a significant one since most iPhone users prefer to tilt their handset sideways — in the same way that they hold a camera — in order to get a better shot of the scene that they are capturing. While GIFs can be filmed either way, the service allows users to create them from videos already saved on their device, the majority of which are likely to be filmed in landscape. As it was before the update, videos shot in landscape came out sideways on Cinemagram, making them unusable. Indeed, YouTube’s one day old Capture app for iOS is built to encourage landscape video taking. The process behind creating and editing gifts themselves has also been simplified. That’s equally important since, speaking from personal experience and feedback, the existing system was a little over-complicated. Cinemagram has made that easier with more obvious controls and labels, although the options themselves remain the same as before. Cinemagram raised $8.5 million at the end of last month and co-founder Temo Chalasani says it is adding tens of thousands of users per day — down from 100,000 earlier this year — while the average user is watching at least 50 cines per day. 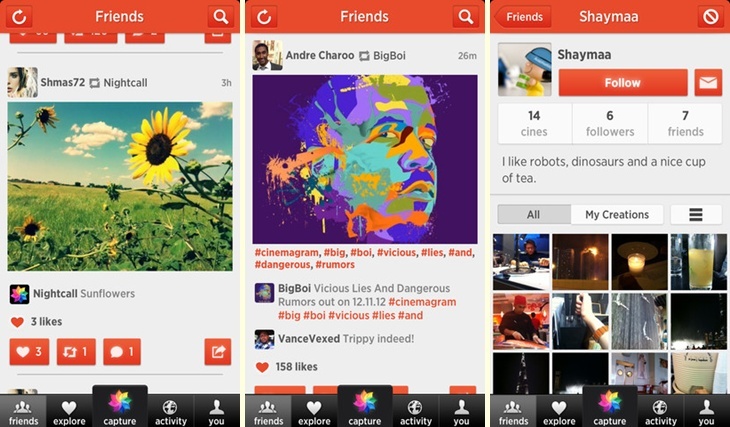 There’s no Android app yet, although Cinemagram has just relocated to San Francisco, from Montreal, and is set to begin hiring; so it seems likely the move to Android will come soon enough. Cinegram is ranked among the App Store’s ‘Best of 2012’.